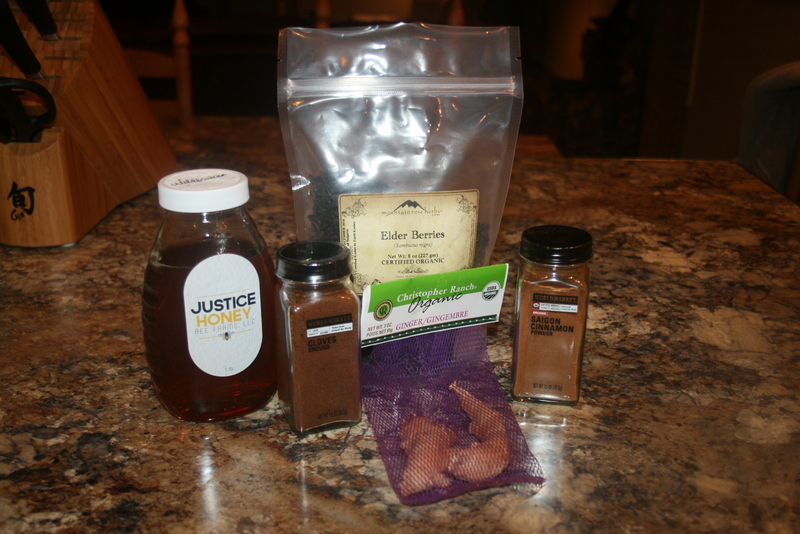 HomeMadeHealthy | Working to bless my family with good health; encouraging you to do the same! 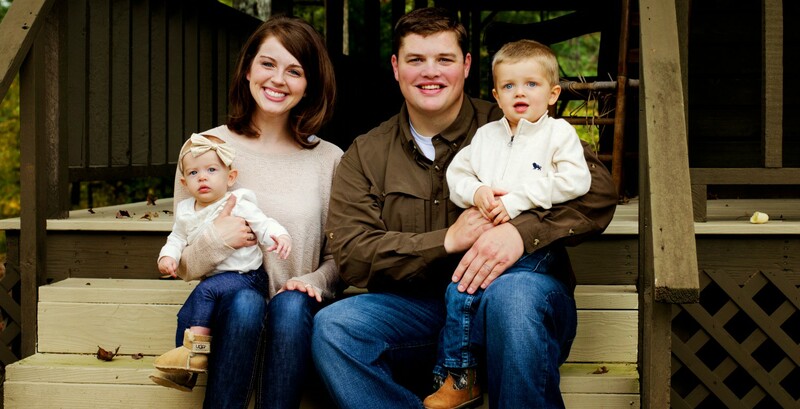 Working to bless my family with good health; encouraging you to do the same! 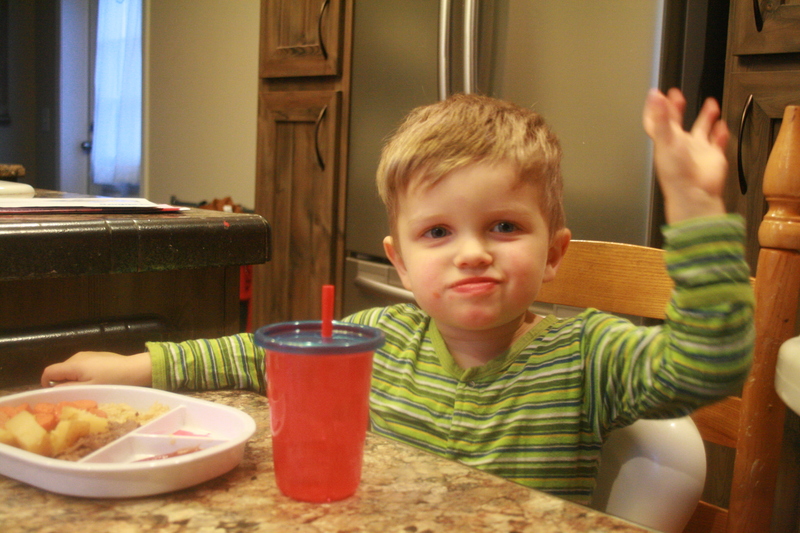 When Jake and I decided to cut out wheat, I started stressing over all of the things that we wouldn’t eat again. So, I decided to make a list of all of the things that we love that we COULD eat. That list was way longer than I expected and it gave me much needed confidence. Among the first few items on that list was BACON. We love bacon. Bacon loves us. I know that there is much debate about how good or how bad bacon really is for you. Nevertheless, We eat BACON once or twice a week and we plan to for the rest of our lives… Until death parts us or Christ returns.— That last part was in our marriage vows. The eating bacon part wasn’t. But, perhaps it should have been. It would be a stretch to call it “healthy”. But it does include all organic ingredients and it is GLUTEN FREE. 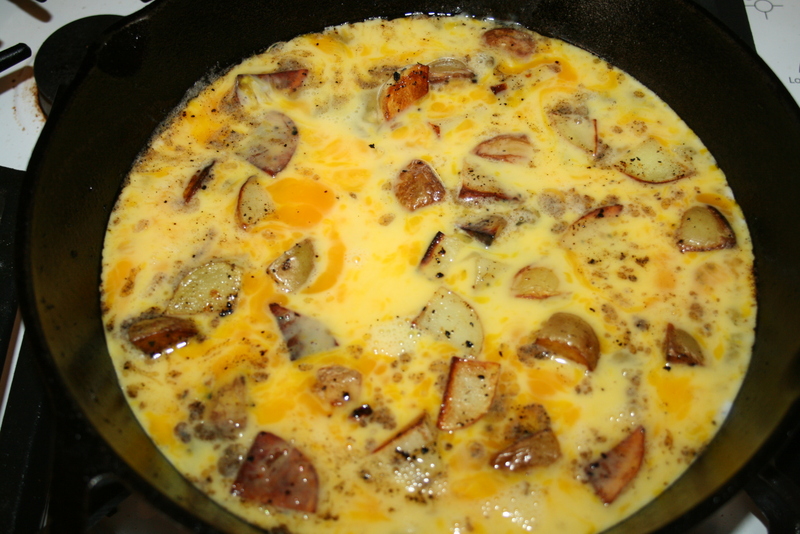 This recipe is by the Barefoot Contessa; I simply modified it to use all organic ingredients and uncured bacon. 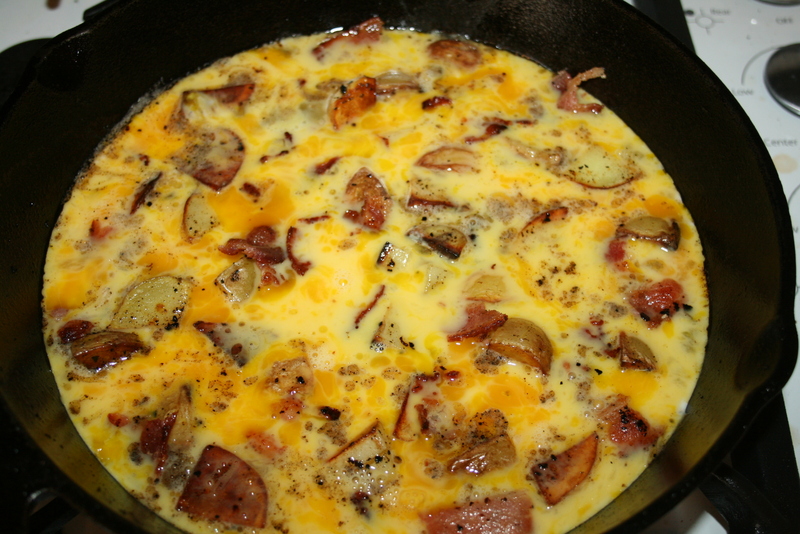 How to cook the best Bacon, Potato, Chive omelet you’ll ever eat. First, start with your BACON, of course. 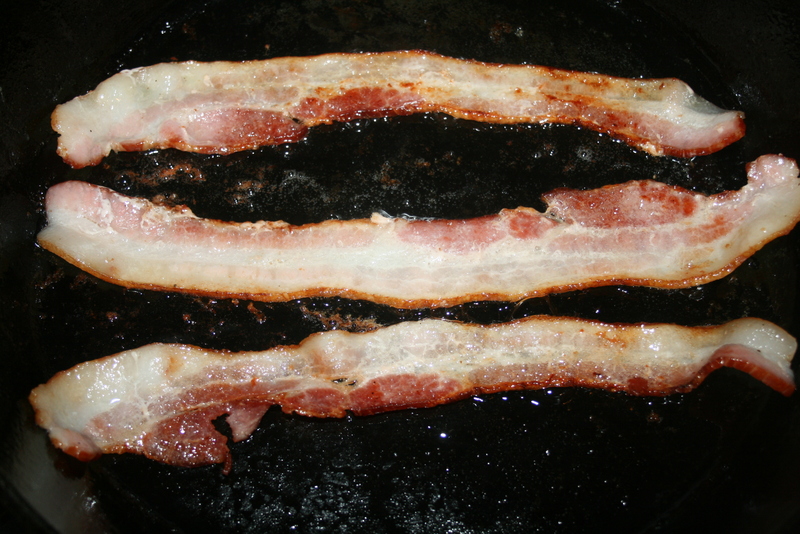 Fry 2 (or 3) slices of uncured bacon in a cast iron skillet on medium high heat until browned, but not crispy. Meanwhile, dice two medium Yukon Gold potatoes into 1 inch cubes. 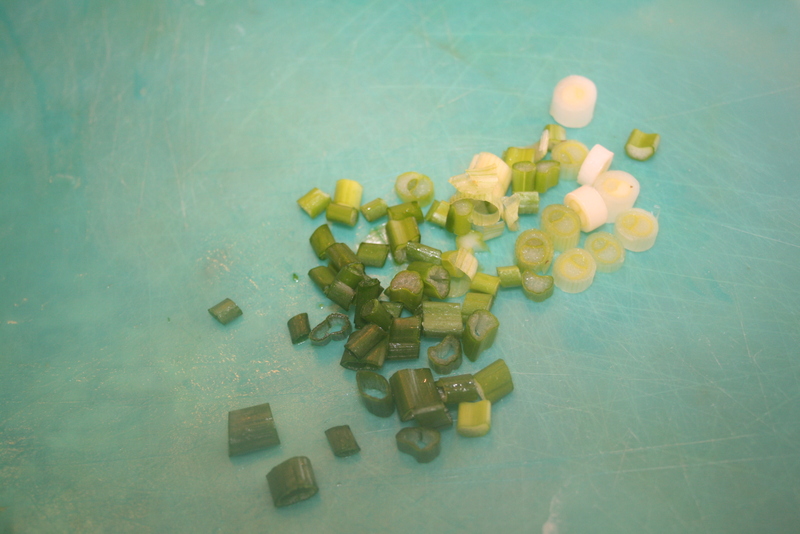 And you may as well want to go ahead and chop your green onion while you’re at it. 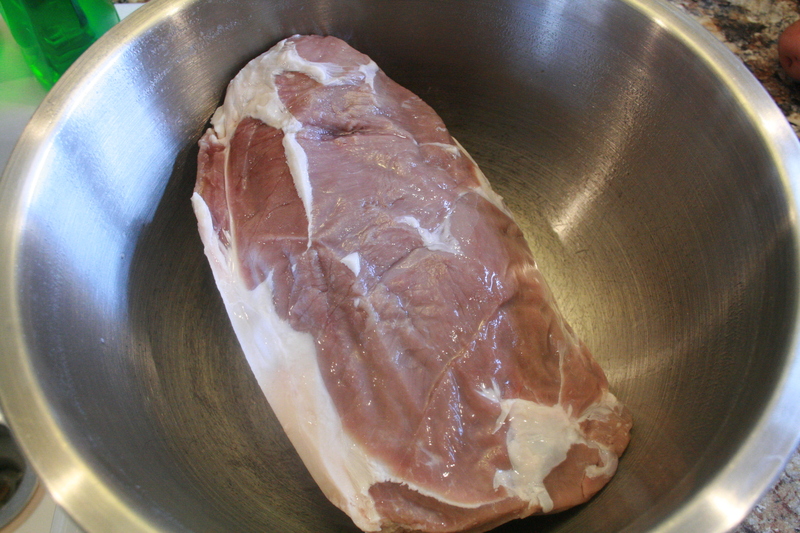 Remove your browned bacon from the skillet with a slotted spoon. 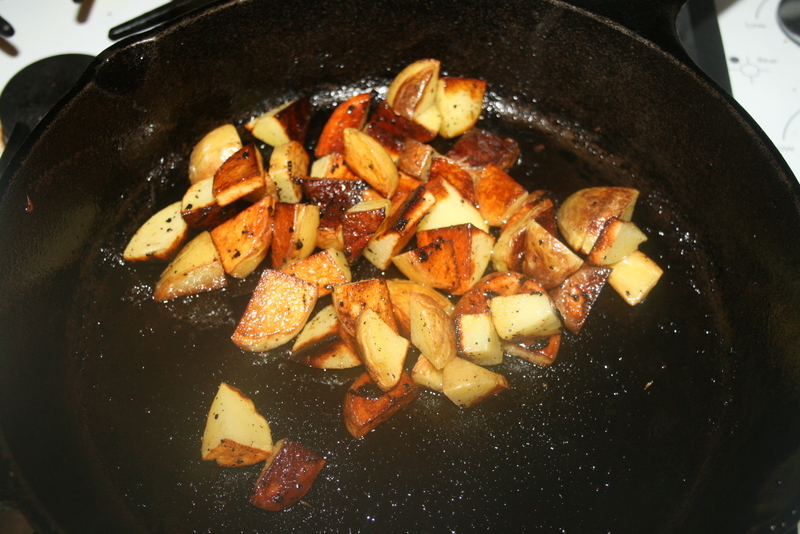 Add your potatoes to cook FRY in the bacon grease, still at medium high heat. Listen, I’ve just got to call it what it is. And we all know the truth. 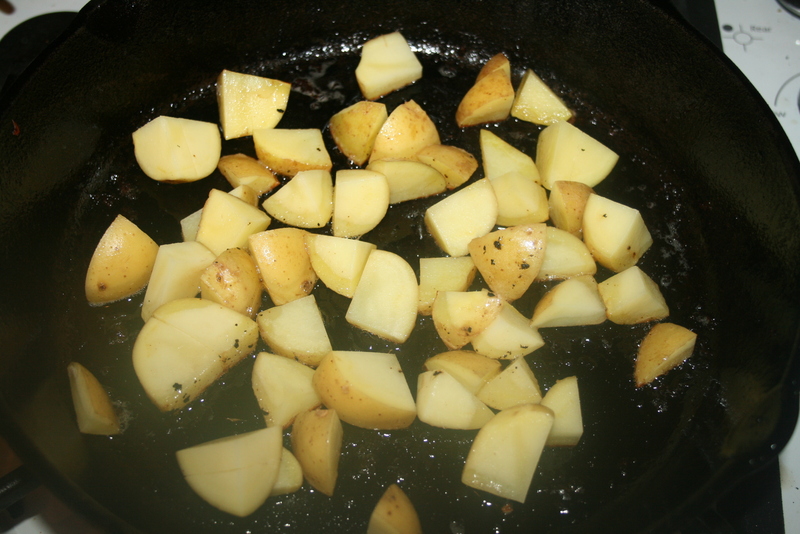 After 8-10 minutes, or until potatoes are fork tender, remove potatoes with a slotted spoon. 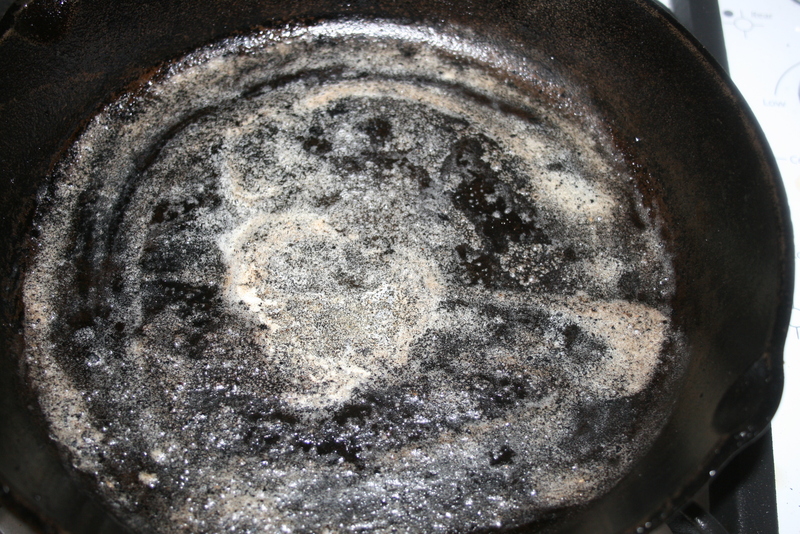 Clean remaining bacon grease out of skillet with paper towels. 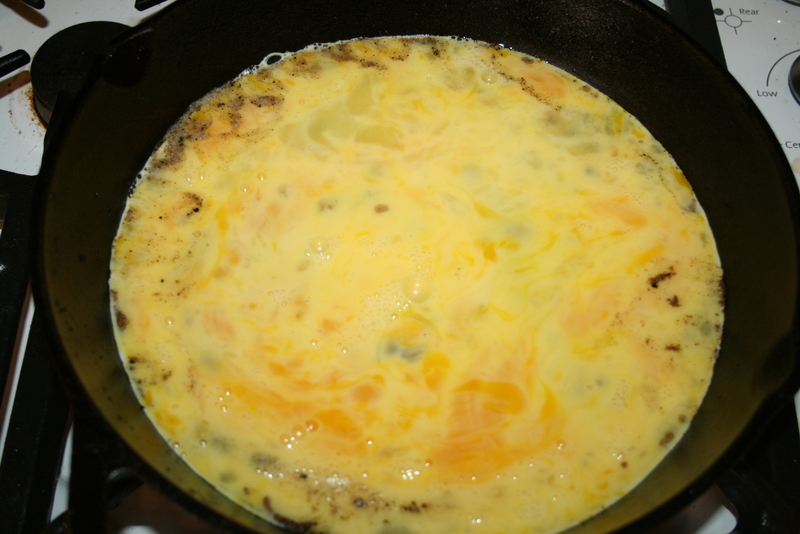 Return skillet to medium low heat and add butter. Then sprinkle in your potatoes. Bake in over at 350* for 8-10 minutes. Remove from oven and cut the biggest piece for yourself. Wait, what? No. No, that wouldn’t be giving and motherly. So do what I do and use this as an opportunity to work on selflessness. Truthfully, if Jake and I eat this as a special Saturday breakfast, no—at any time that we eat this, we split it. As in cut her down the middle and grab two forks. I’m telling you that so that you wont spend your time making this fabulous masterpiece to split between 4 hungry people who will be left wanting more. The above stated sheer honesty was another attempt at selflessness. Yes it was. 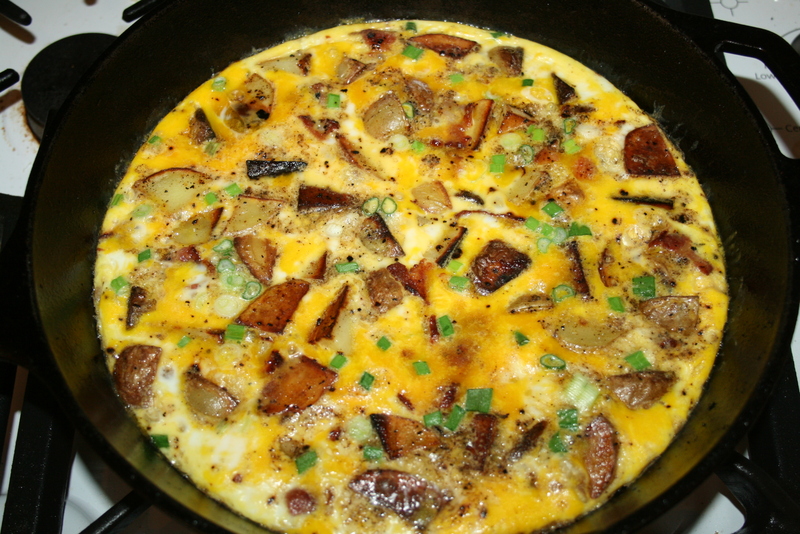 In all seriousness, the original recipe states that it will feed TWO and then goes on to suggest making another omelet in another skillet instead of doubling the recipe for one skillet. 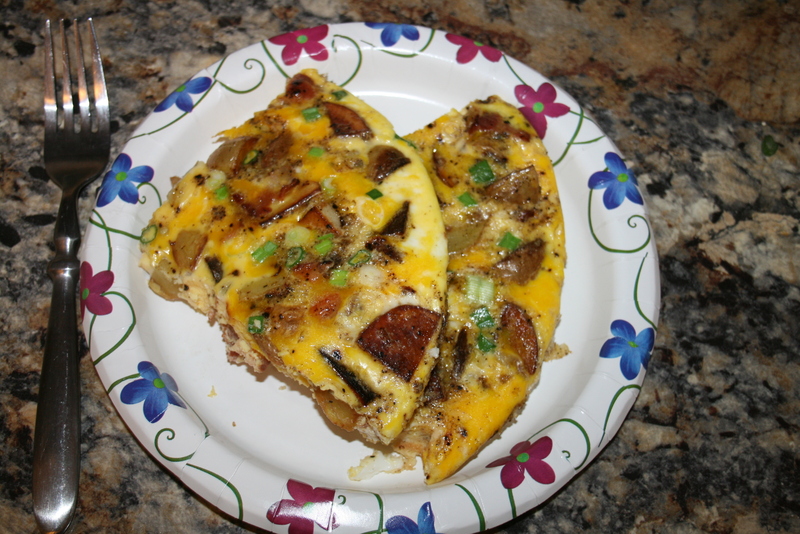 I hope you love this omelet as much as we do. And I hope this gives all of my GF friends a fun treat for breakfast as I find that to be the most challenging wheat free meal of the day. I am pretty sure I ate a roast every single Sunday lunch of my childhood life. Even still, when we eat at my mom’s for Sunday lunch, which happens to be almost every single Sunday of my adult life, she cooks a Sunday roast. It’s a stability thing for me now. Just Kidding. Except not really. Mom. Don’t stop! I decided last week that it should be perfectly acceptable to eat a roast on a day of the week other than Sunday. So, I cooked a roast on a Wednesday. Hello weekday roast. 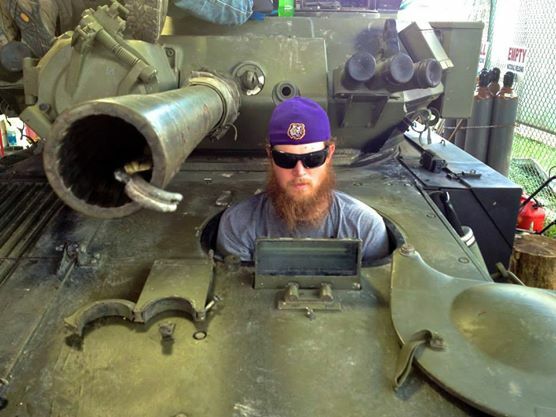 Welcome to the rotation. Oh, and you’ll need about three hours before time to eat. Set your oven to 325*. 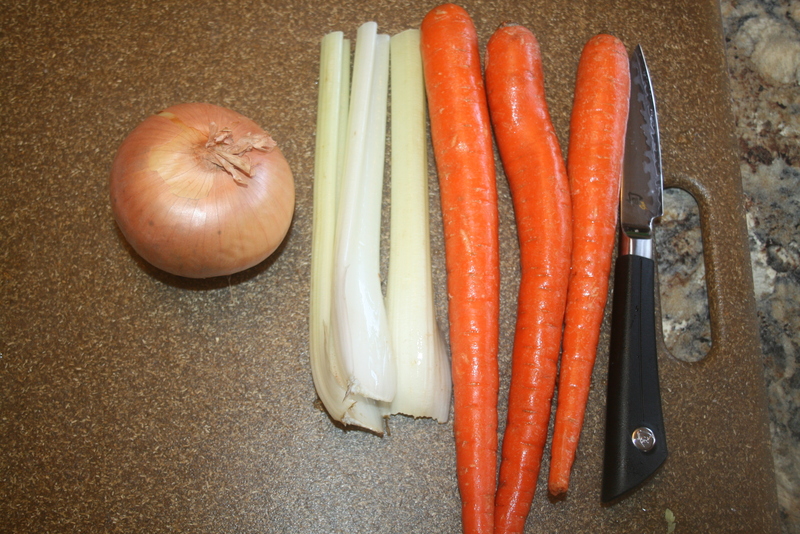 First, scrub and chop your vegetables; set aside. 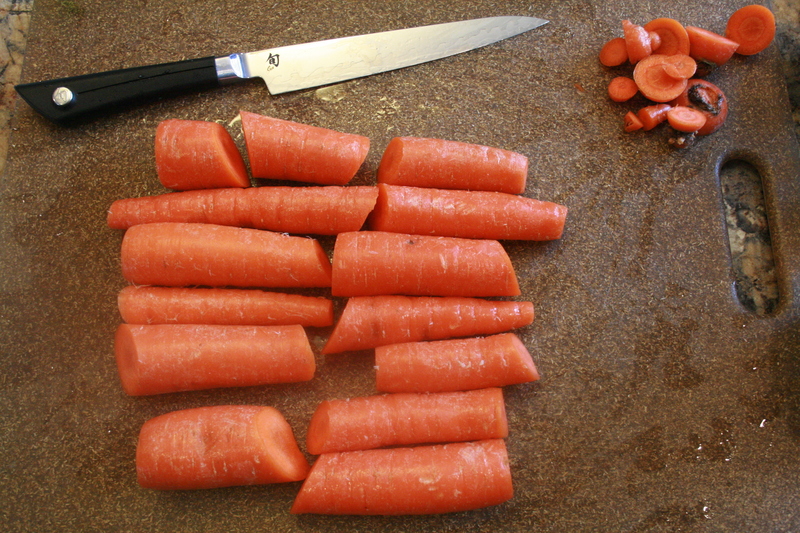 I chop my carrots in half. 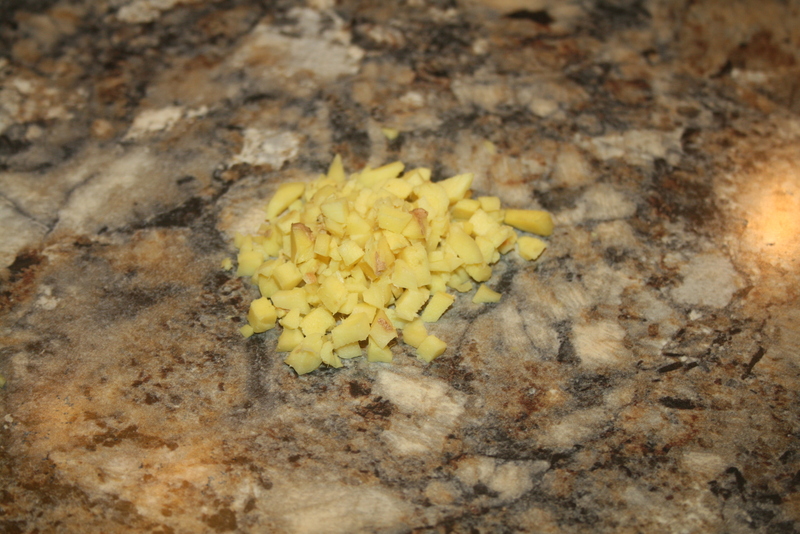 I leave the small potatoes whole, chopping only the largest potatoes into halves. You don’t want them too small since they will be cooking for so long. I just quarter my onion. 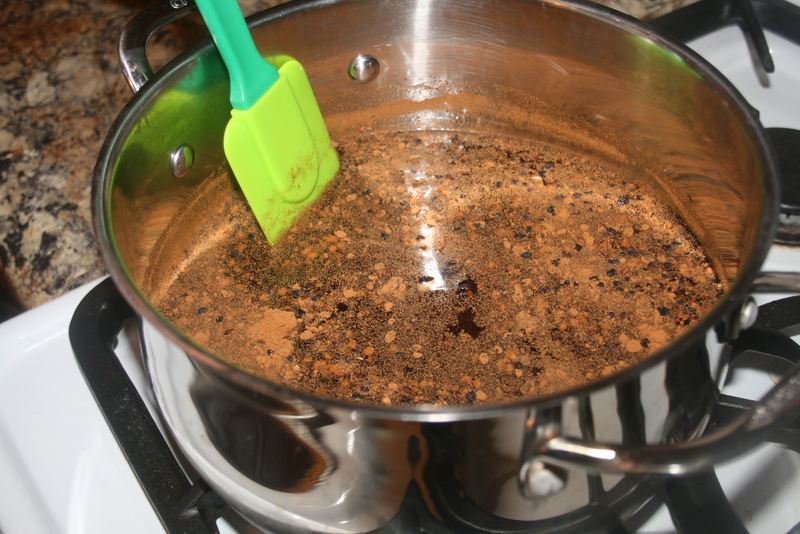 Next, pour two tablespoons of your oil of choice into your dutch oven, on medium-high heat. 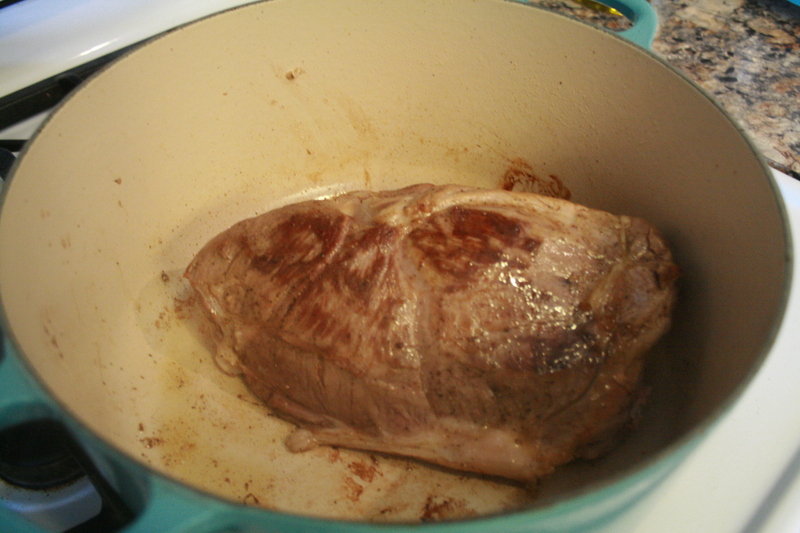 Sear your roast for 2-3 minutes, or until lightly browned on each side. 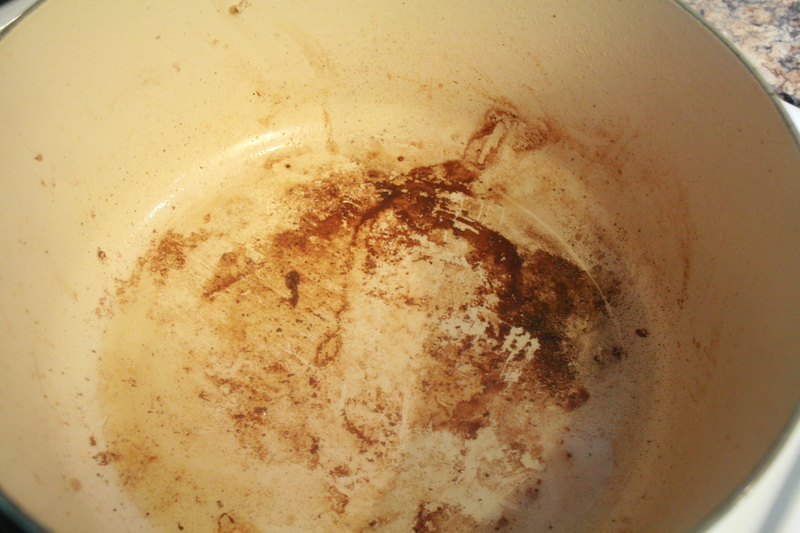 Remove roast, set aside. 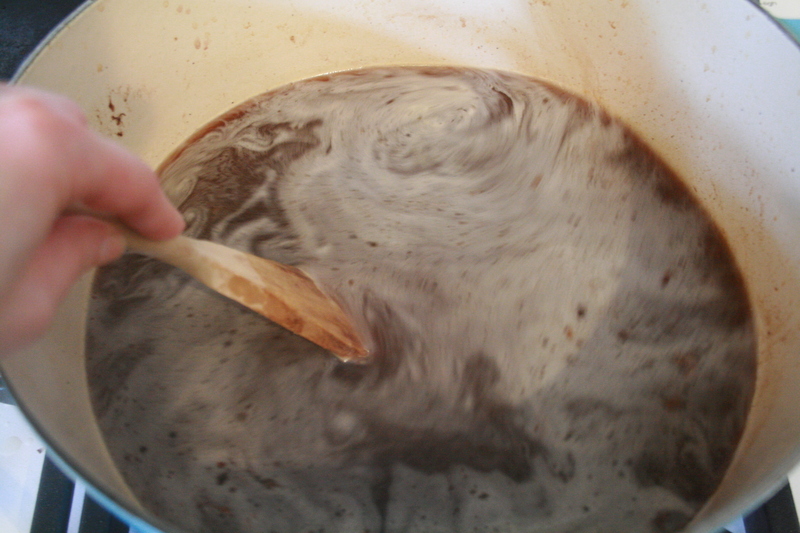 Pour beef stock into your pot and use a wooden spoon to scrape all of the browned bits of goodness left over from your browned roast into your stock. Your kitchen will start smelling fabulous about now. Return roast to the pot, adding veggies also. Take your roast out of the oven and transfer meat to a cutting board. Let the roast rest for 20 minutes so that it wont fall apart while slicing. That rule tip is from my mom. I adhere to it when the people I’m feeding aren’t sitting at the table or standing around the kitchen staring at me in anticipation. So, like, never. 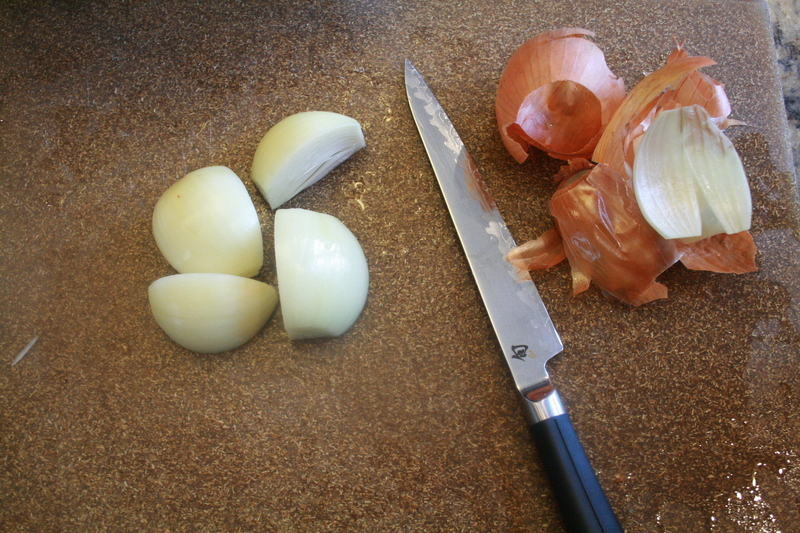 Slice into pieces of desired thickness and return all pieces to the vegetables and gravy. Serve with rice, or broccoli, or squash, or your family’s favorite veggie. Mom says you always need to serve a green vegetable. So I usually do that. Because she says so. You’re supposed to obey your parents, ya know. I’ll take that and call it a success. Here’s to an easy meal for those crazy, busy days! My sweet sister-in-law and I are always looking for natural ways to prevent and fight sickness for our little families. 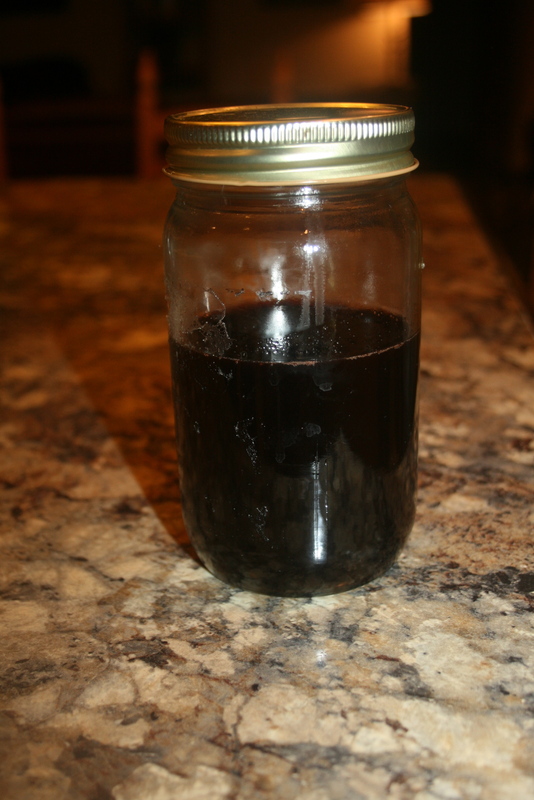 A few friends shared with us that they give their kids Elderberry Syrup to prevent and to fight the flu. Seriously, these friends swore by it. 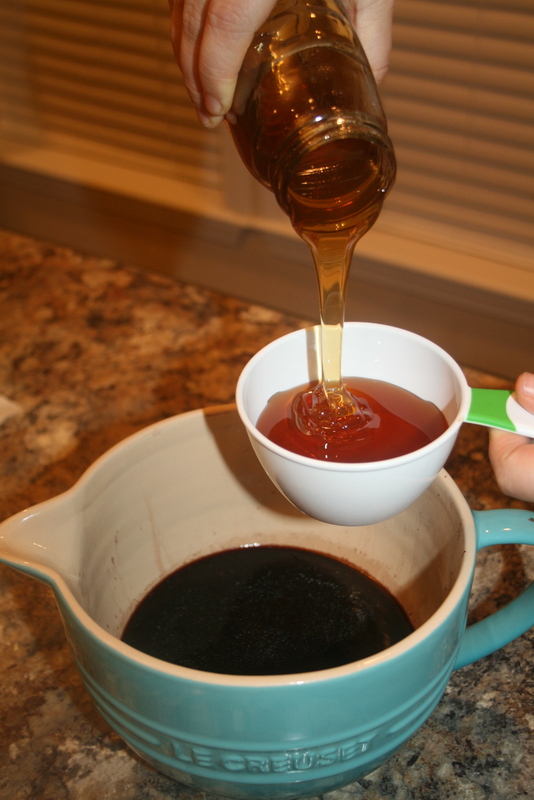 A homemade, organic remedy to prevent the nasty flu? Yes! Some for us, please! So, we did some research (see link way below) and set out to give it a try. It was EASY and we had so much fun preparing it! 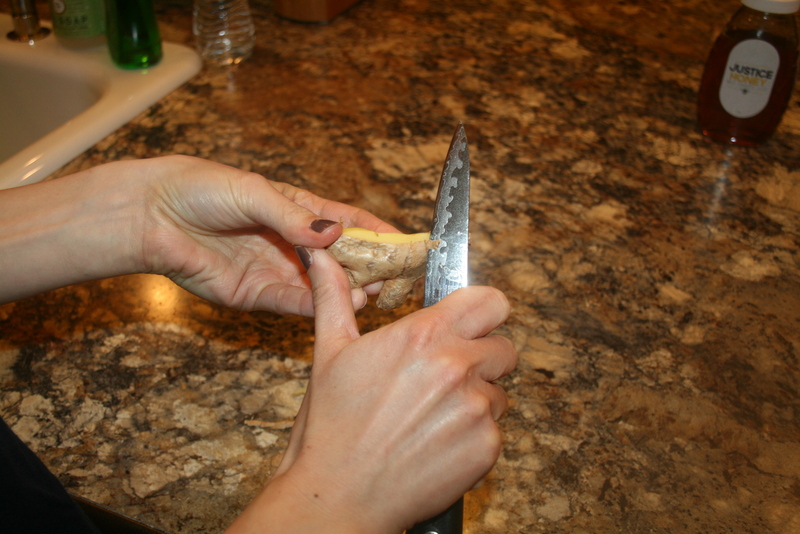 First, peel and finely chop your ginger root. 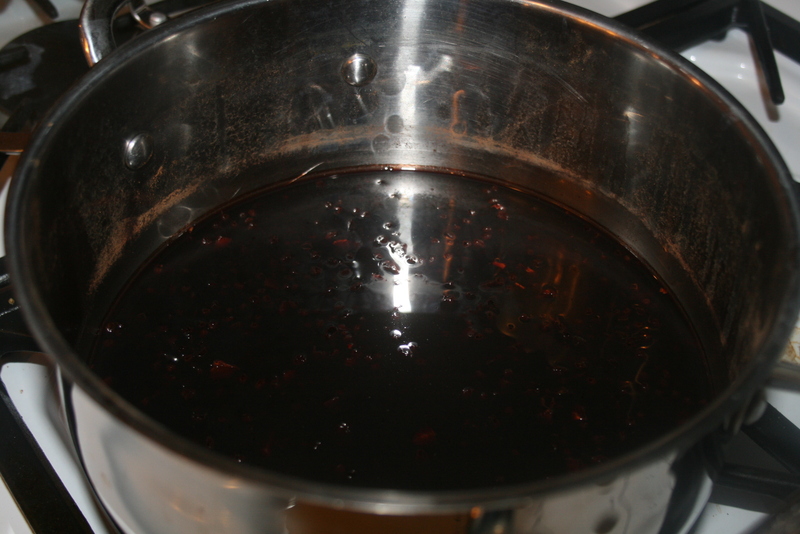 Then, add your water, berries, ginger, cinnamon, and cloves to the boiler. 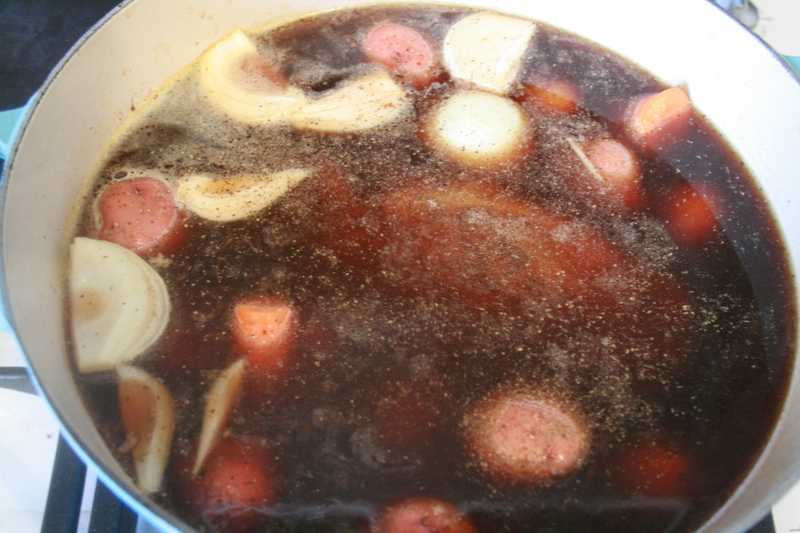 Bring to a boil, then cover and reduce to a simmer for 45 minutes to an hour. And sit down and have a little visit with your sisinlaw/ bestie while you wait– that’s what I did! 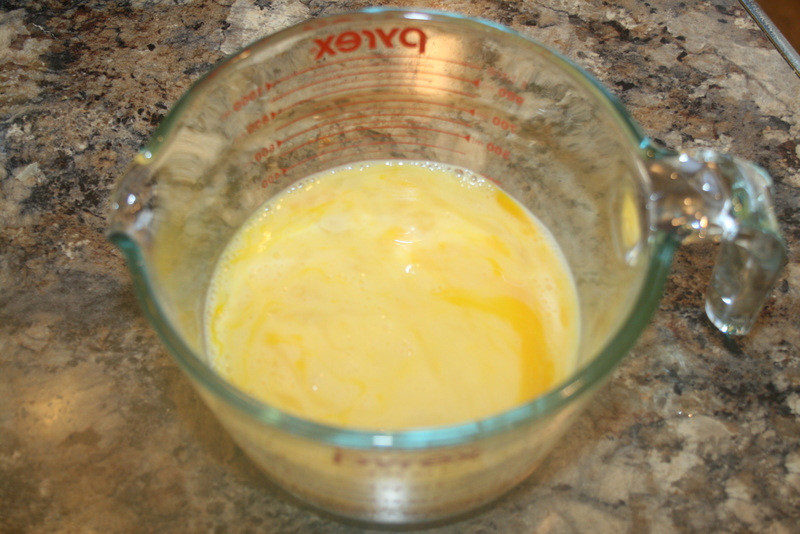 Remove from heat and cool for 5-10 minutes, or until warm. 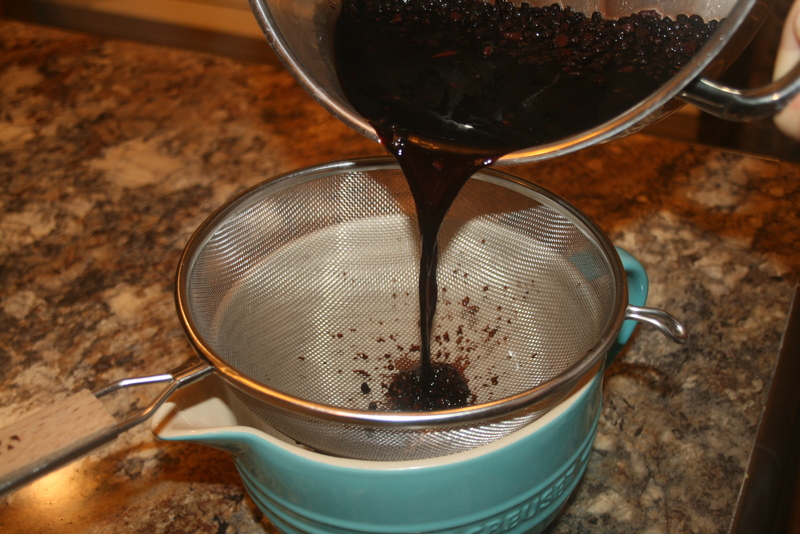 Pour through a fine mesh strainer into mixing bowl. 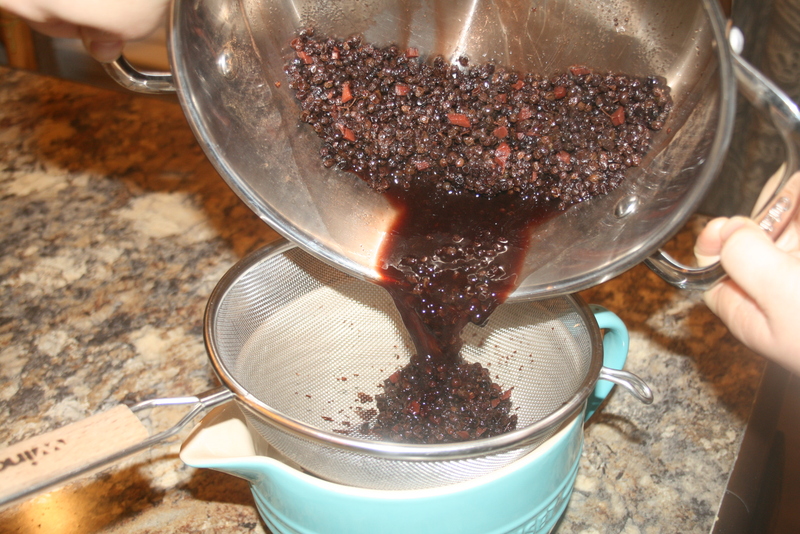 Discard Elderberries (with a frown on your face). Add your Honey and mix well. Take it yourself and give it to your family once daily to boost your immunity to colds and the flu. Recommended Doses: 1/2 to 1 tsp for kids and 1/2 to 1 Tbsp for adults for prevention. If you do contract the flu, take normal dose every 2-3 hours or until symptoms are gone. Wishing you a Happy and HEALTHY winter season. This blog rocks my world. ^^ This gal has it going on. Check it out! I have several irrational fears. I’m not talking about a fear of heights or snakes- I’m talking about real fear of things that don’t have nearly the same kind of potential to cause any harm. I have overcome one, at least 37 more to go. One evening, a few weeks ago, Jake was gone for work and I was sitting on our bed, folding laundry. That’s when I saw it. It darted out from under my bed and behind the chest of drawers so quickly that my mind almost denied it. Did a mouse just run across the floor?! Apparently since we live out in the country now and our house isn’t on a slab, this was bound to happen at some point. I, however, was unaware of this fact. And somehow I had completely missed the “there is a small mouse in our house” experience in all of my 25 years of life thus far. My brother in law kindly came over, mousetrap and broomstick in hand to take care of the situation. This is Zac. I was actually hoping for something more like this, but I was happy to see him with that broomstick. 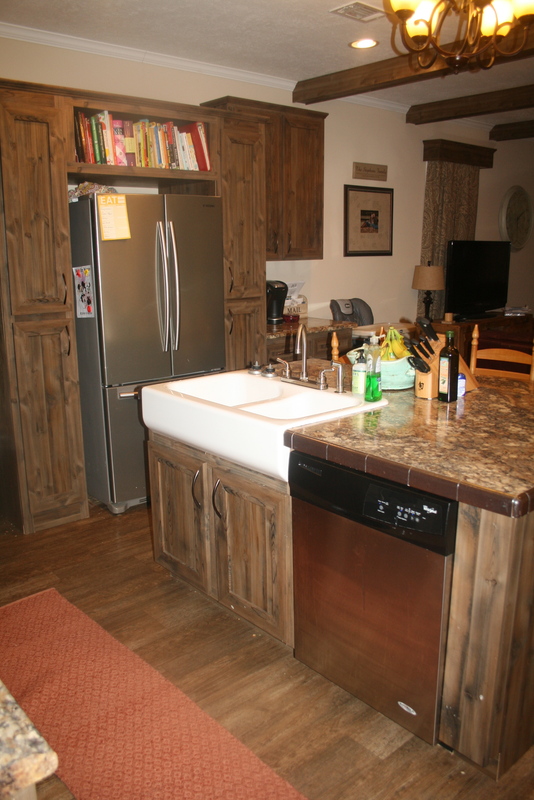 My kitchen Island, where things got crazy. After checking behind all of my appliances, Zac said that he thought I would be fine for the night and that he was going home. I communicated a panicked “please don’t leave me”, complete with crazy eyes and a quivering lip. At this, he literally pulled my dishwasher out of the island. There he found a hole that was drilled and then left unused, leaving a small space for Stuart Little to let himself right on in. (‘Preciate ya, island builder-man/ plumber– NOT!) Zac plugged the hole, left a mouse trap in the space, put the dishwasher back in place, and assured me that he was certain that the mouse had left through that very hole and I could rest easy. I hesitantly decided not to hold him at gunpoint there with me until Jake came home the next morning. Just kidding!—sort of. I let him go home and went to bed to have sweet, sweet nightmares about mice attacking me in the night. My eyes popped open around 3:30 am. I heard some sort of weird scratching sound and I knew immediately what it was. I sat straight up to see it, right there in my bathroom, literally trying to scratch his way up my cabinet. This mouse was literally ninja crawling in the small space between the cabinet and bathtub. Paralyzing fear overcame me. And by paralyzing fear I mean sweaty palms, racing heart, loud drumming in my ears, “WHAT AM I GOING TO DO TO SURVIVE THIS” kind of fear. I sat there and watched him for four, yes, FOUR long, agonizing hours of sheer panic and aloneness. By morning I was a wild eyed, exhausted, hysterical ball of frayed nerves. Of course when the sun came up, the little rat disappeared again. He was slow playing me. Jake came home with 12 mouse traps. TWELVE. That’s about one mousetrap for every hundred squarefeet of our house. He was determined to kill the mouse that very day and I was determined that we needed to move. Just kidding. We went to church, came home, no mouse. We went to my parents, came home, no mouse. We went to our House Church, came home, no mouse. We went over to his parents, came home, no mouse. That night, after putting our kids down, I sat in the bathtub trying to calm my nerves and come to terms with the fact that I was going to sleep going to be up all night with a mouse hiding somewhere in my home. And then something caught my eye. There it was, there with me in the bathroom, scratching at the shower door. I screamed for Jake and he came running (literally) with bb gun in hand. One shot and the mouse was down. I am trying to remember another time when that kind of relief has flooded me. I slept great that night, right? Wrong. For days weeks I left lights on at night, nervously checked behind doors and furniture constantly, wanted to spend the night with my parents when Jake was gone, etc. It was pathetic. And yes, I’m embarrassed about it now. But, one day it hit me. This fear was irrational. I mean, I’ll never be excited or even comfortable with the fact that a mouse could reinvade my home, but I can’t let the fear of that keep me from doing things that I should in my own home, like walking barefooted at night, or letting my kids sleep in their own beds. More real and more damaging irrational fears that I have come from insecurities that I have about myself, mostly born out of what I think others will think. These are things like not inviting that new couple from church over to my house because I live in a tiny house and they don’t. Am I really that afraid of what someone would think about me because of that? I have kept from resolving issues with someone out of fear that I could make things worse with my sometimes not so eloquent wording. I have before kept myself from things like teaching a Sunday school class because I was afraid of the commitment or afraid to go to an evening event because it was taking place in that weird hour before bedtime when my otherwise sweet kids often turn into whiney nut cases. I mean, I can’t let people see my kids have a meltdown, right? I am resolving to overcome lots of these not so little irrational fears that have the potential to keep me from being who I am or who I should be. 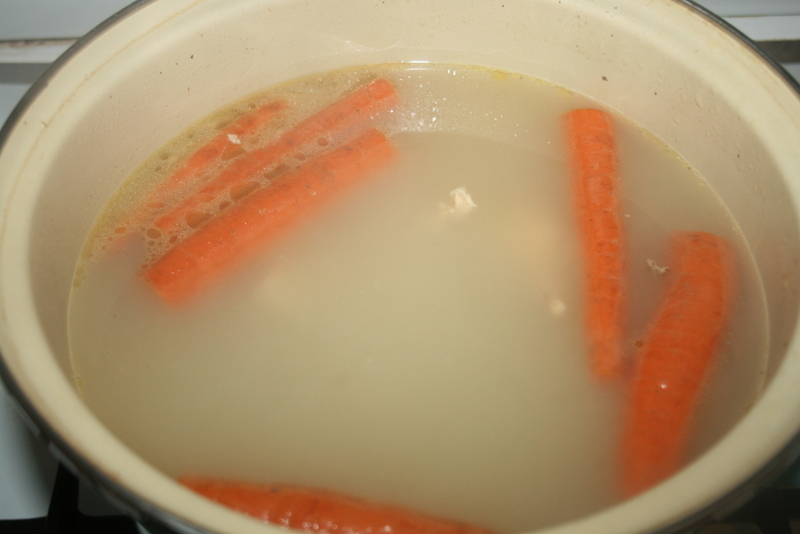 I have started making chicken soup about once a week. It’s an easy meal to prepare, it makes a great lunch or dinner meal, it makes enough for left overs, it is best made with leftover chicken (ensuring that I can get use out of the entire whole chicken that I roast each week), and most importantly, I make it that often because my husband asks for it. 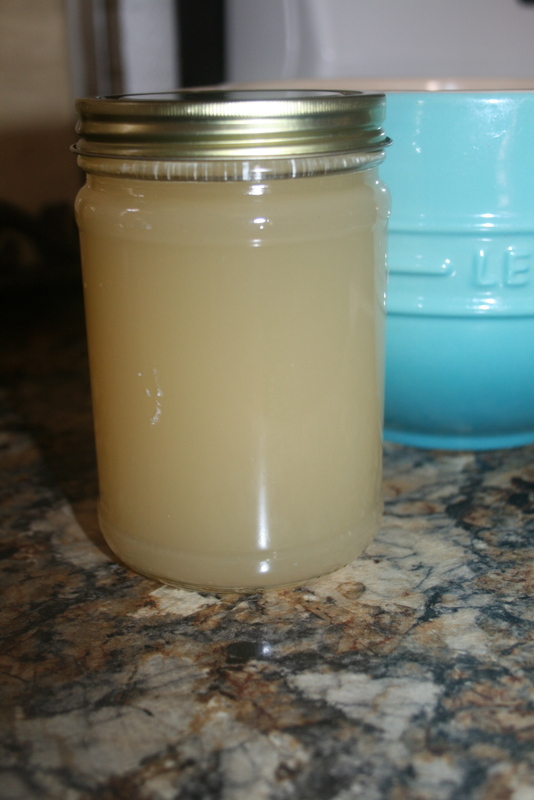 The best part of the chicken soup is the HOMEMADE BONE BROTH. 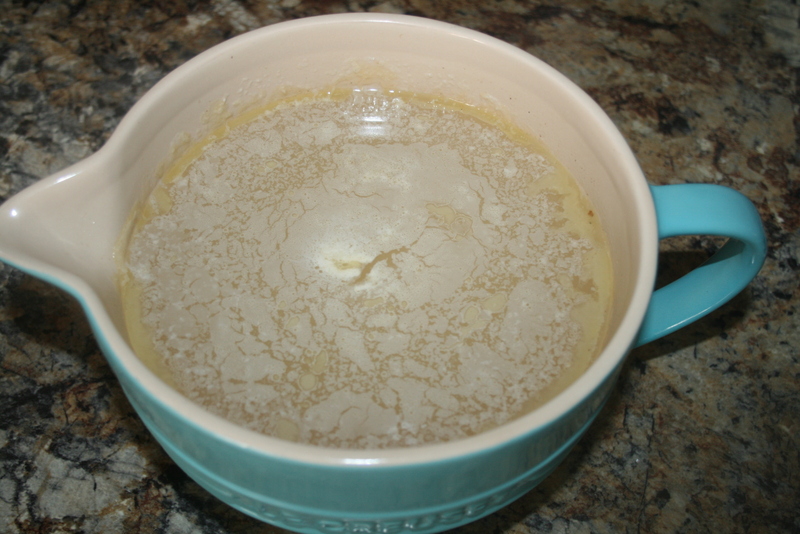 The Bone Broth that I am talking about is the broth that our great grandmothers made, years ago, before there was such a thing as boxed broth at Brookshires. 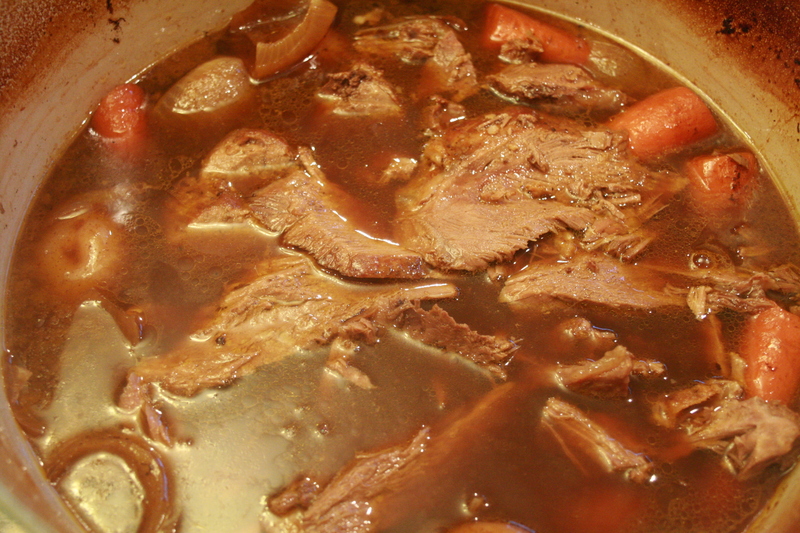 There are so many health benefits from eating delicious bone broth. 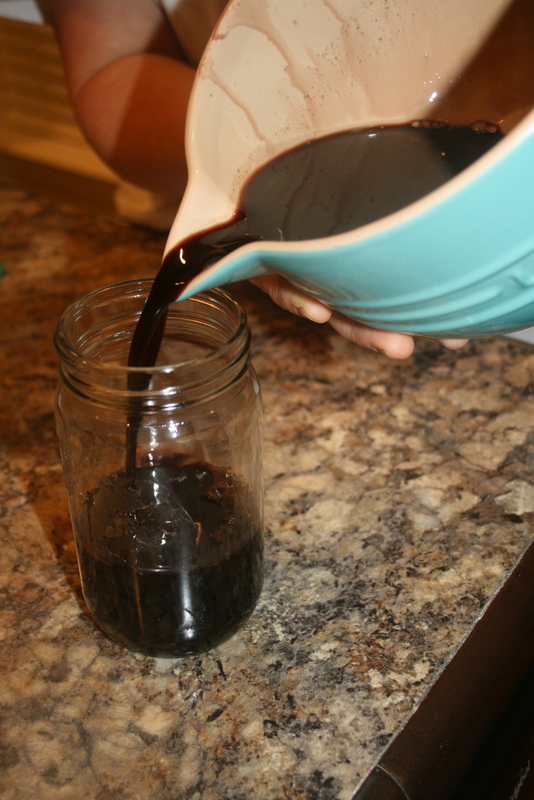 It is an immune boosting, gut healing, anti-inflammatory wonder! Perfect for cold and flu season. 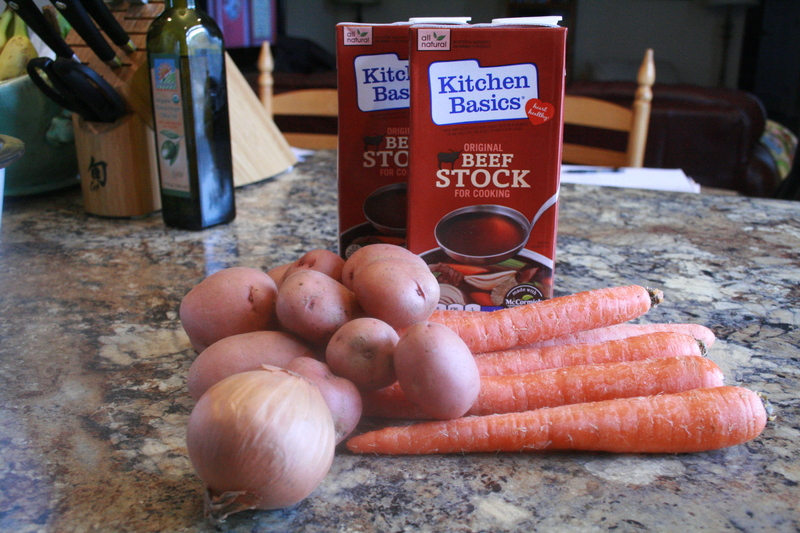 And there is no store- bought broth (even organic) that is as healthy and beneficial as a broth you make at home. It’s easy! 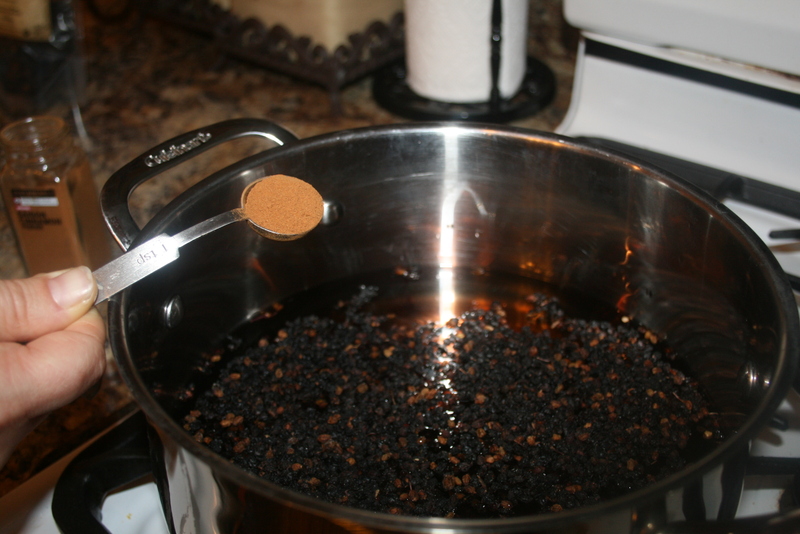 Your home will smell delicious during the process of preparing it, and you will feel like quite the accomplished individual when you’re finished. I find the hardest part to be collecting enough bones. 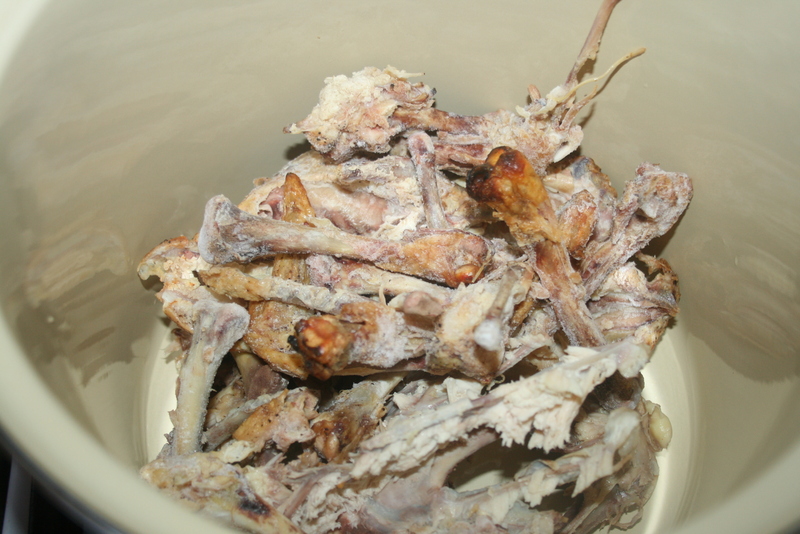 I store my leftover bones in a bag or tupperware container in the freezer. At our last big family gathering (with grandparents, aunts, uncles, etc. ), my mom roasted two whole chickens. It hit me in the middle of our meal that I was sitting in a bone broth ingredient gold mine! I totally unashamedly asked everyone for their chicken bones! So my family was literally throwing their chicken bones in a pile on a plate in the middle of the table. It was a scene straight out of a modern day Chevy Chase Christmas Vacation film. Thanks again, family! I used those bones this week! 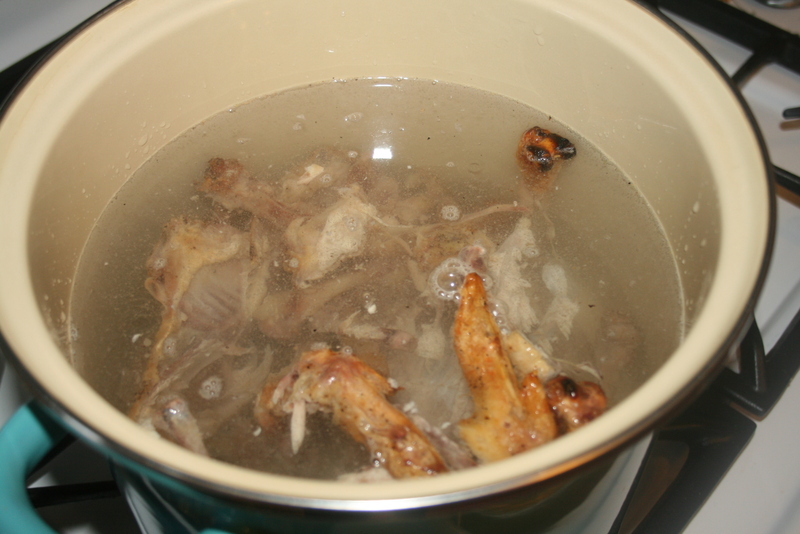 You can get all weird about the germs from 15 different people’s left over chicken bones, but you boil them for like 1,000 minutes, so I find it to be pretty safe! 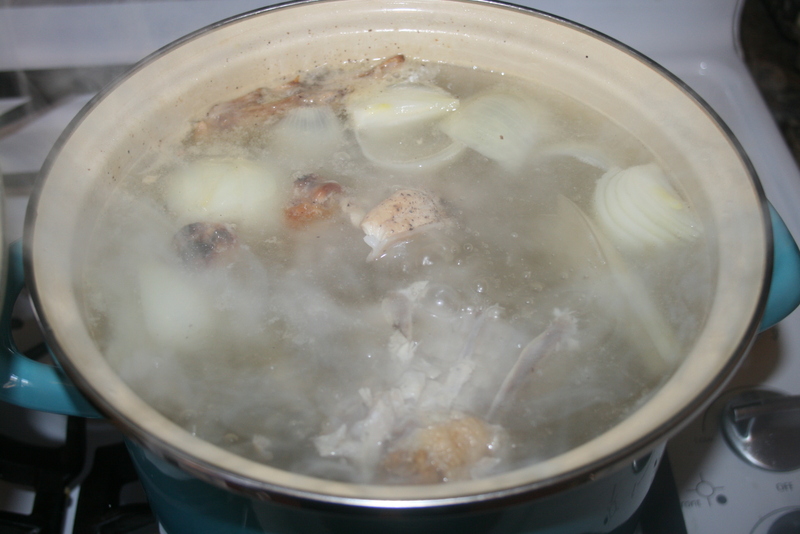 Just dump your chicken bones right into your stock pot. Cover with 4 quarts of filtered water. 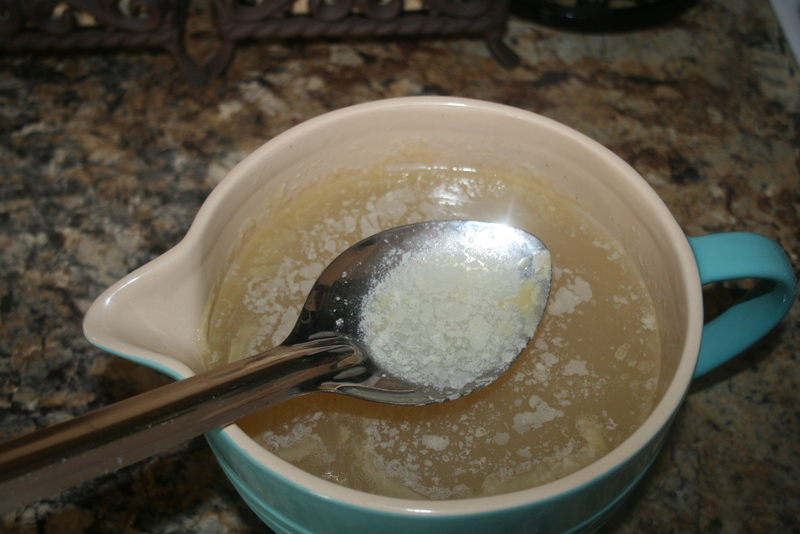 Add 2 tablespoons of Apple Cider Vinegar. 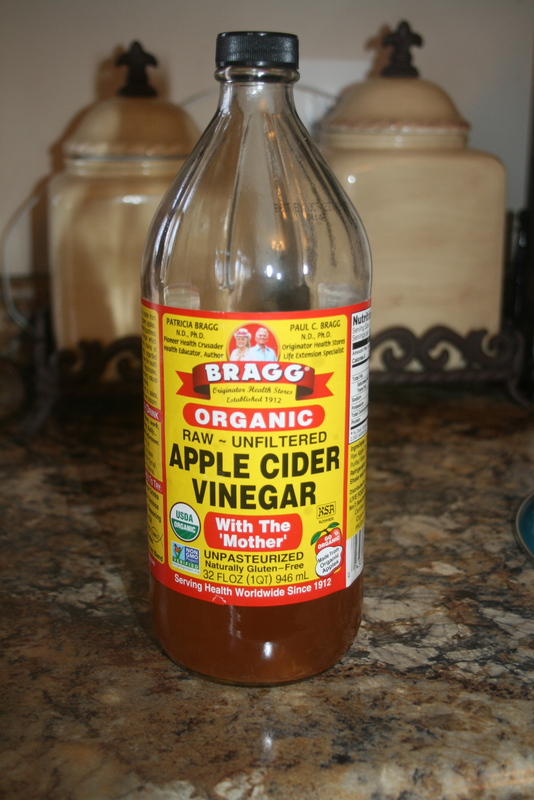 (I use Bragg’s Raw, Unfiltered, Organic.) *Don’t omit this step. This helps draw the minerals out of the bones. Bring to a boil. If any scum rises to the top, simply scrape it off and discard. 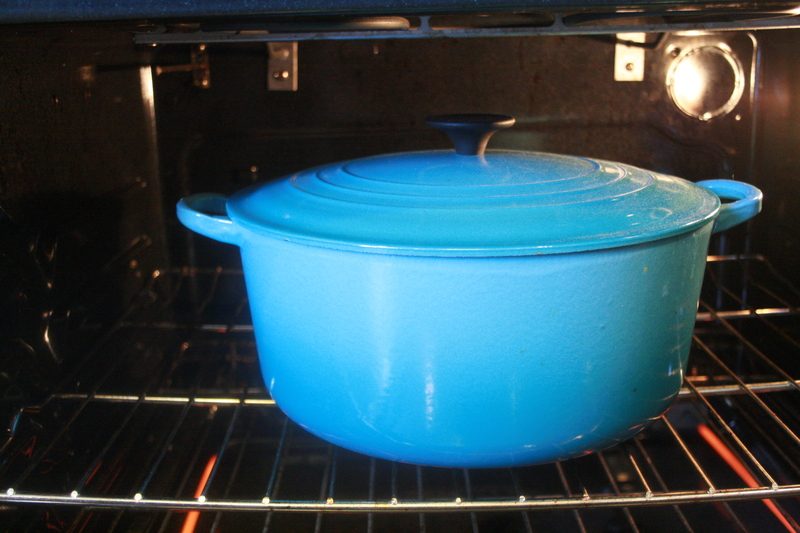 Cover, then simmer on low heat for forever –specifically anywhere from 8-24 hours. 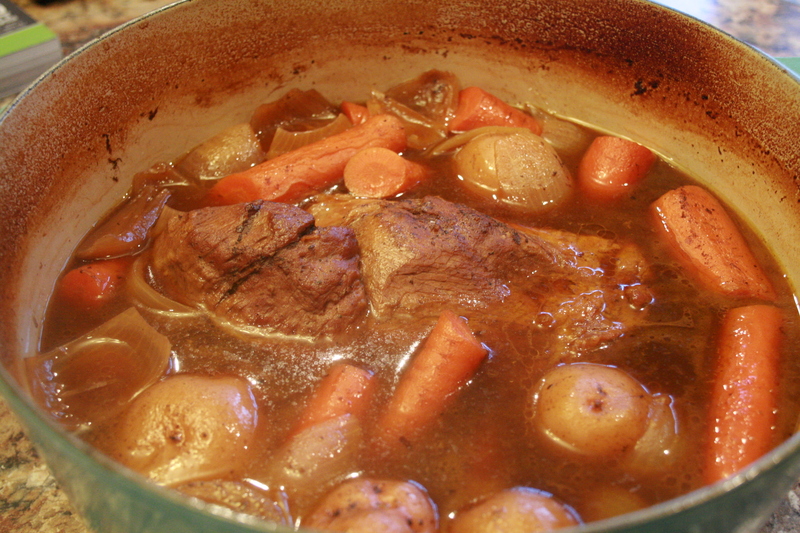 The longer you cook your broth, the richer it will be both in taste and healthy minerals, etc. 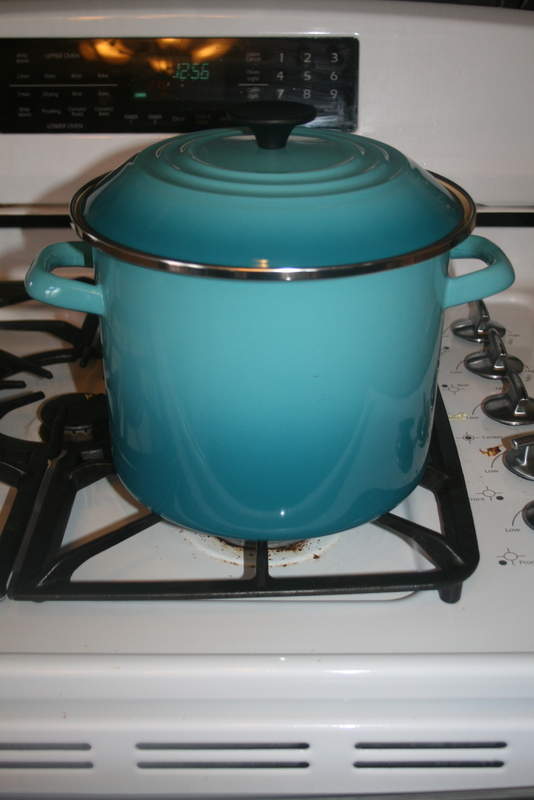 If you (or in my case, my fireman husband who also is also refusing to let me have a space heater again this winter season) feel uncomfortable having your stove on overnight or while you are gone, you can cook your broth in your crockpot. I have done it. Works great! 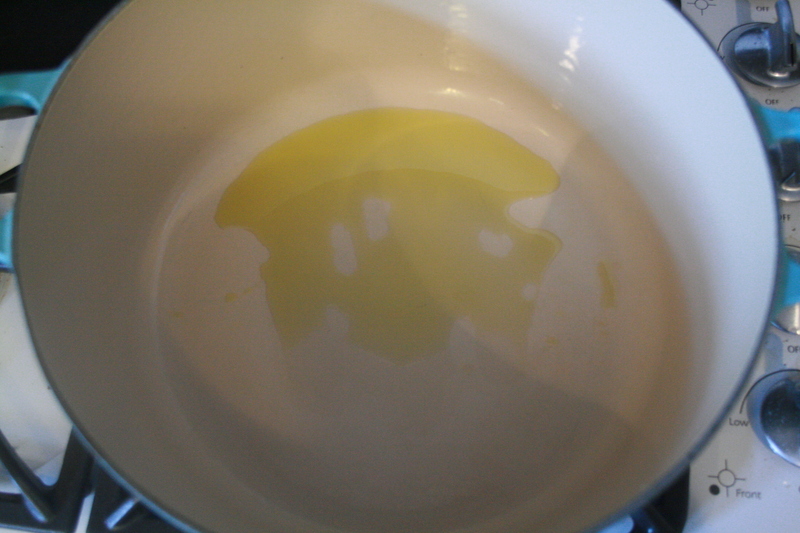 When cooked, pour your stock through a FINE MESH strainer into a large bowl (or two). I don’t have a picture of this step because it was done around midnight when I tend to forget things like snapping pictures for the blog. Oops! Store in the fridge, cooling until fat rises to the top. 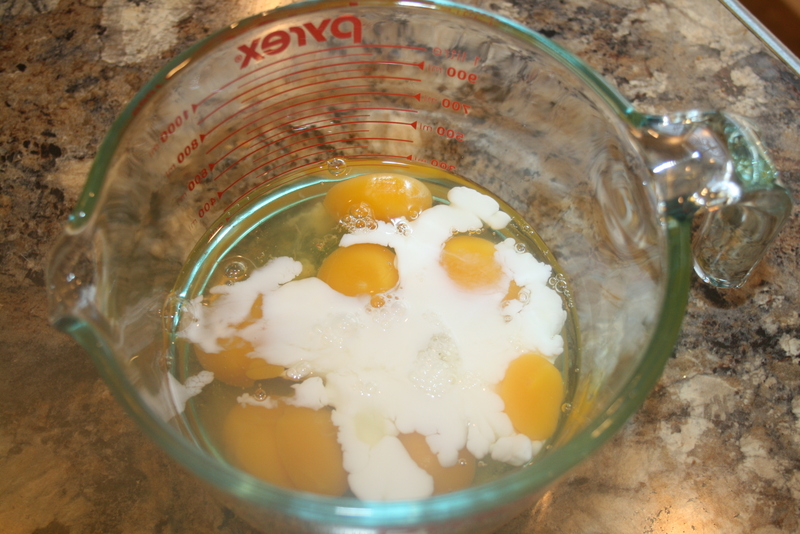 Simply skim fat off of the top and discard. Store in the fridge for up to a week or the freezer for up to 6 months. Or use it immediately to make your family some delicious, flu-busting soup! Stay warm in this freezing weather, Y’all! And enjoy some soup with your family. They will love you for preparing it for them. I am so sure of it! We will have a very traditional family dinner; ham, cheesy potatoes, rolls, green beans. For dessert lemon pie! Yum! I can’t wait!! Thanks for entering! More prizes to come. Merry Christmas Eve and Happy Cooking! Cookbook Giveaway! Merry Christmas from me. 1. There is so much that I love about Christmas. One of the things that I love most is the GIVING! 2. You all have blessed me so much this year by following the blog, and I find so much joy in sharing with you. THANK YOU for making it so much fun!! 3. I have been talking tons, maybe too much, about how much I LOVE Jamie Deen’s Good Food Cookbook. I just can’t help myself! I love it so much!! Because I love GIVING, I love you guys, and I love Jamie Deen, I want to give one of his cookbooks away as a CHRISTmas Present from ME to one of YOU! Just comment below telling me what you plan to cook or eat at your family’s CHRISTmas gathering. 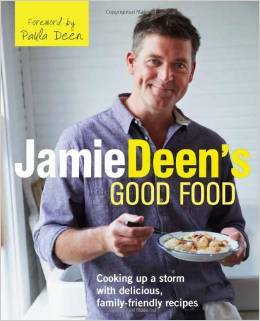 One person will win Jamie Deen’s Good Food Cookbook! I’ll announce the WINNER mid-day on Christmas Eve. Your Comment May take a little while to appear.